Weekly Clarion, November 28, 1877. There is a marked difference between the corn-meal ground at the South, and that which is sent out from Northern mills. If any one doubts this, it is not she who has perseveringly tried both kinds, and demonstrated to her own conviction that the same treatment will not do for them. An intelligent lady once told me that the shape of the particles composing the meal was different–the one being round and smooth, the other angular. I am inclined to believe this. The Southern meal is certainly coarser, and the bread made from it less compact. Moreover, there is a partiality at the North for yellow meal, which the Southerners regard as only fit for chicken and cattle-feed. The yellow may be the sweeter, but I acknowledge that I have never succeeded in making really nice bread from it. Indian meal should be purchased in small quantities, except for a very large family. It is apt to heat, mould, and grow musty, if kept long in bulk or in a warm place. If not sweet and dry, it is useless to expect good bread or cakes. As an article of diet, especially in the early warm days of spring, it is healthful and agreeable, often acting as a gentle corrective to bile and other disorders. In the winter, also, it is always acceptable upon the breakfast or supper table, being warming and nutritious. In summer the free use of it is less judicious, on account of its laxative properties. As a kindly variation in the routine of fine white bread and baker’s rolls, it is worth the attention of every housewife. “John and the children” will like it, if it approximates the fair standard of excellence; and I take it, my good friend–you who have patiently kept company with me from our prefatory talk until now–that you love them well enough to care for their comfort and likings…. Receipts for Corn Bread made of Southern Indian Meal. Enough meal to enable you to roll it into a sheet half an inch thick. Spread upon a buttered tin, or in a shallow pan, and bake forty minutes. As soon as it begins to brown, baste it with a rag tied to a stick and dipped in melted butter. Repeat this five or six times until it is brown and crisp. Break–not cut it up–and eat for luncheon or tea, accompanied by sweet or buttermilk. The Weekly Clarion, November 27, 1873. 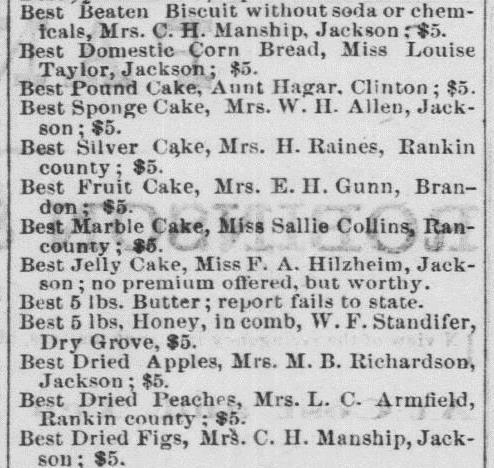 In 1873, Mrs. Charles Henry Manship won a $5.00 prize for the “Best Beaten Biscuit without soda or chemicals” at the State Fair. 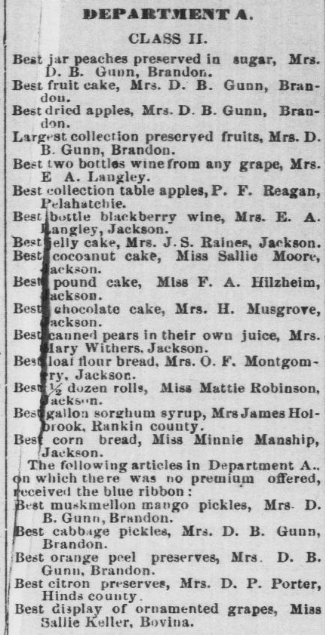 Daughter Minnie Manship Phelps was also known for her excellent beaten biscuits. Highly prized for their soft flaky layers, beaten biscuits were very labor intensive to make. Since beaten biscuits contain no leavening agent, the dough was either beaten with a rolling pin or mallet, or fed though a machine called a biscuit brake to create flaky layers. Similar to an old fashioned clothes wringer, biscuit brakes had rollers operated by a hand crank. The biscuit dough was folded and fed through the rollers over and over to trap air between the folded layers. Work to repair the two Visitors Center (Phelps House) chimneys has been completed. Over the years, the mortar on both chimneys had become badly deteriorated. Little or no mortar remained in some sections, allowing water to seep in through areas of mortar loss. To repair the chimneys, the old crumbling mortar was carefully removed by hand. New mortar matching the strength of the existing mortar was applied. 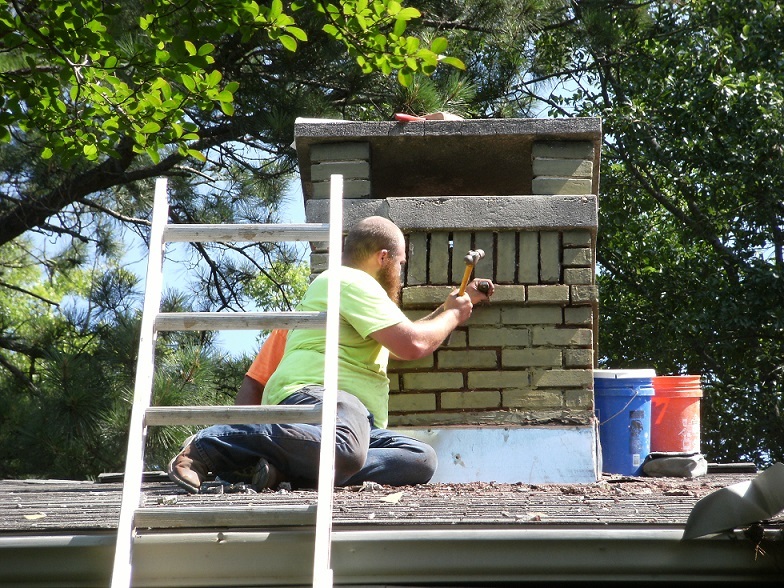 The repair will prevent further chimney deterioration. 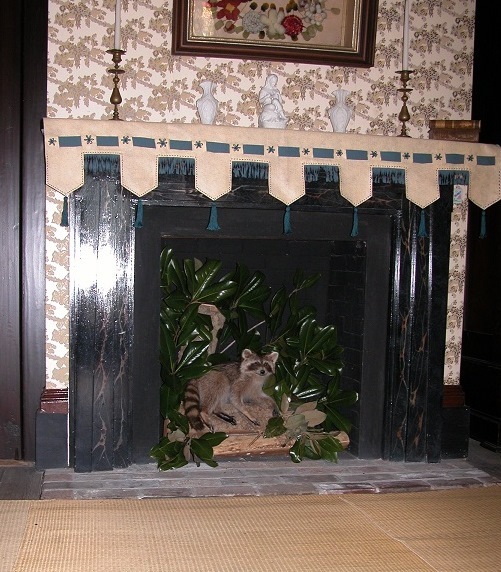 Parlor fireplace, Manship House Museum. 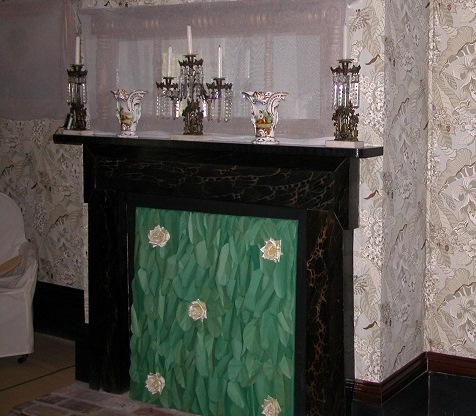 In the warm summer days, the open fireplace is an unsightly object, and pretty devices to hide it are very acceptable to the careful housekeeper. We offer our readers one that is pretty, new, and easily made. Take a piece of board that fits exactly into the space. Tack over it with small tacks a cover of green baize, stretching it tightly and smoothly over it. Make out of stiff, green paper a number of leaves, dahlia, rose, tulip, lily, etc., making them very large, and enough of them to cover entirely the green baize. Baste these leaves down at the stem, curl them at the edges with the scissors, and gum them down on the baize. Do not sew them anywhere except at the stem. Now make large paper-flowers, or, if you have them, take artificial flowers, and smooth them over. Place the flowers among the leaves, either following our pattern, or using your own taste in the arrangement. Five large roses should be placed at the corners and in the centre. Sew the flowers at the stem; but if you wish to fasten the flowers themselves down, use dissolved gum-Arabic. Summer fireplace treatment, Manship House Museum. Many fireplaces are not sufficiently pretty to be visible when the time for open fires is past, and yet it is a puzzle to know just how they can be made more pleasing to the eye. If it is an open fireplace the prettiest manner of decorating is to fill it with growing ferns, concealing the pots in which they are planted with moss; and if the ferns die replace them from time to time, as may be necessary, with fresh ones from the woods. Lace above the ferns, slanting from side of the fireplace, a branch covered with gray lichen, and if possible a stuffed squirrel, as if it were running, or a gay-plumaged stuffed bird. The effect is more pleasing than can be imagined. Should the fresh ferns be considered too troublesome, as they will of course require care, a moss-covered log can be laid across the andirons, and the squirrel or bird placed on this. 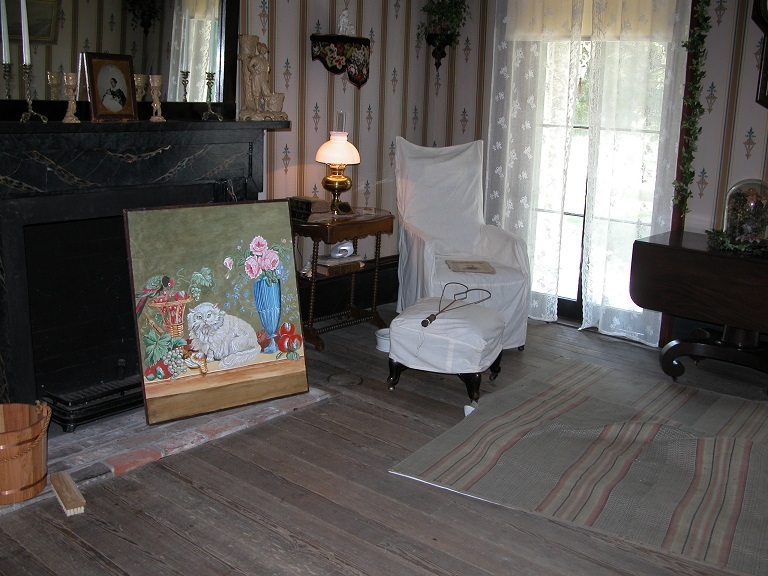 Sitting room, Manship House Museum. Now is the time that tries women’s souls, and no sound is heard o’er the house save the scrub-brush, the mop and the broom. The spring cleaning is at hand. Blankets and Furs. – And first, there are all the woolens, blankets, etc., to be washed, and all that can be spared (for we dare not put them all out of sight, lest we provoke another snow-storm), are to be packed away in deep chests, and plenty of cedar boughs strewn over them, or else powdered camphor gum. The fortunate possessor of a cedar-wood trunk need have no apprehensions, but without that, the moth-millers will make sad havoc among your furs, woolens, etc., unless you guard them carefully. The Carpets. – All carpets do not need to be taken up; those which do not, can be loosened at the edges, the dust-brush pushed under a piece, and a clean sweep of all the dust can be made. Then, wash the floor thus swept, with strong soap-suds, and spirits of turpentine after. Then, tack the carpet down. The odor is soon gone, if you open your windows, and you can feel safe for this summer, at least. Upholstered furniture can be treated to the same bath, if applied with a soft, clean cloth, and the colors will receive no injury. But before using it, brush the cushions with a stiff hand-brush and a damp cloth, so as to take away all the dust. A good way to clean straw matting after it is laid, is to sprinkle corn-meal over it, or damp sand, and sweep it thoroughly out. Windows Washed. – Windows are hard to wash, so as to leave them clear and polished. First, take a wooden knife, sharp-pointed and narrow-bladed, and pick out all the dirt that adheres to the sash; dry whiting makes the glass shine nicely. I have read somewhere, that weak black tea and alcohol is a splendid preparation for cleaning the window-glass, and an economical way to use it would be to save the tea-grounds for a few days, and then boil them over in two quarts of water and add a little alcohol when cold. Apply with a newspaper and rub well off with another paper, and the glass will look far nicer than when cloth is used. The Beds. – When mattresses and feather-beds become soiled, make a paste of soft-soap and starch, and cover the spots. As soon as it dries, scrape off the paste and wash with a damp sponge, If the spots have not disappeared, try the paste again. 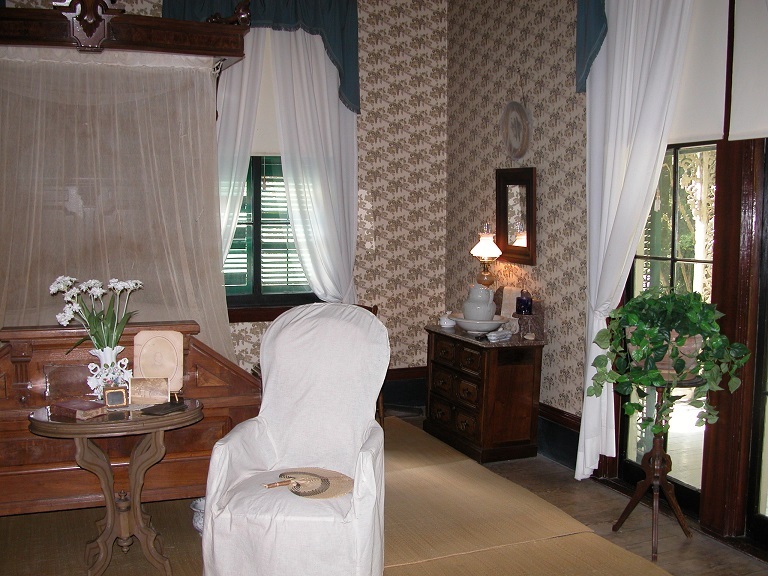 Master bedroom, Manship House Museum. During the nineteenth century, families prepared their homes to survive the oppressive heat, dirt and insects of the hot summer months. Each spring, households received a very thorough cleaning. Carpets were taken up, cleaned, aired, and stored for the summer. Straw matting was generally used in the summer for coolness and comfort. All upholstered furniture received light cotton or linen covers to protect them from sunlight and dust. Fireplaces were cleaned and adorned for the summer. Brass andirons were removed, cleaned, and stored until fall. Mosquito netting or gauze was draped over beds to help deter insects. Gauze, muslin, or tissue was used to cover gilded surfaces such as picture frames or parts of chandeliers to protect them from insect damage. Shutters and blinds were often kept closed to discourage mosquitoes and flies, which were a constant problem. Families adjusted their living arrangements to fit the weather, choosing to reside wherever it was cooler and more comfortable. Chairs could be moved to windows and doorways to allow inhabitants to enjoy any slight breeze. These changes would remain until the early fall, when another extensive house cleaning took place and the heavy winter furnishings were returned to the rooms. Luther Manship. Call number Z/1129.000 MDAH Collection. Mayor Issues a Proclamation Requesting Honors be Paid Distinguished Citizen – Capitol Will Close During Morning as Token of Respect to the Deceased. JACKSON MOURNS PASSING OF BELOVED CITIZEN. Secretary of State Jos. W. Power announced last night that the State Capitol will be closed this morning during the hours of the funeral of Luther Manship, former Lieutenant Governor and member of the Mississippi Legislature. Luther Manship, a former Lieutenant Governor of this State, and at one time one of the best known men on the lecture platform of America, died here yesterday morning at 10:30, following an illness extending over several months. The funeral services will be held this morning from the family home at 11 o’clock, conducted by the Rev. W. G. Henry, and the deceased will be laid to rest beside his wife in Greenwood Cemetery. 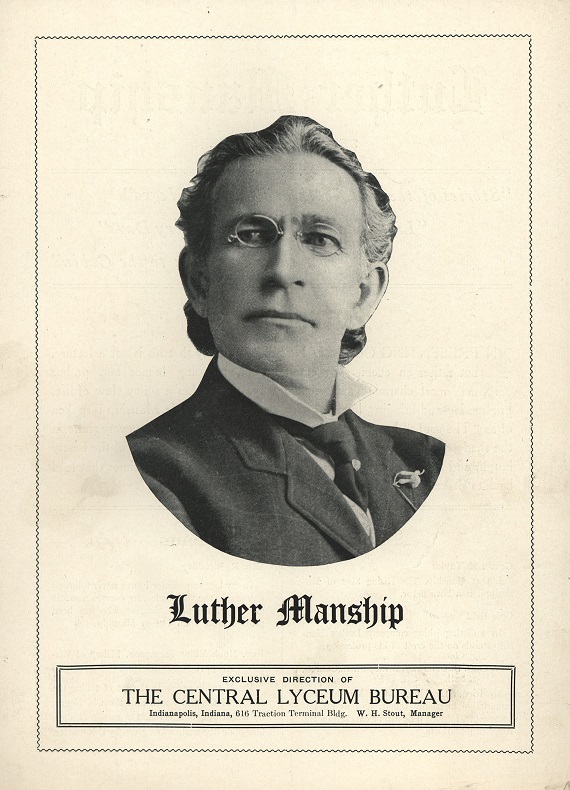 Luther Manship was born in this city April 16, 1853. His father was a mechanic of note and served this city for two terms as mayor, surrendering the city to the Federal troops in 1863. 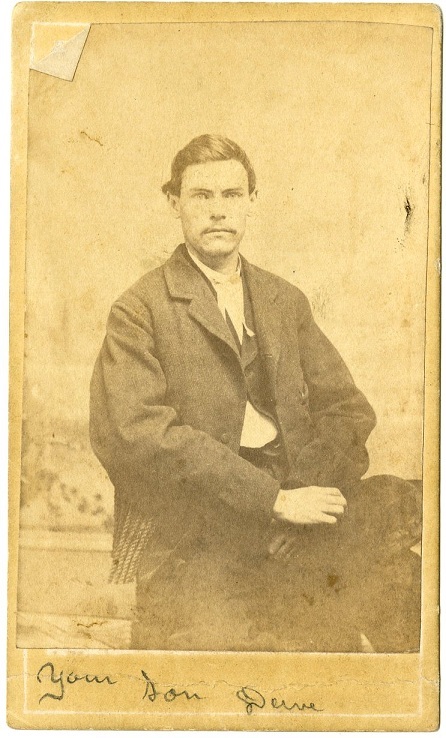 The deceased early in life decided to enter the railroad service and served an apprenticeship in the shops in McComb. For several years he was a member of the board of aldermen of Jackson, and in that capacity accomplished many things for this city. In 1896 he was honored with election to the Lower House of the Legislature and was elected Lieutenant Governor under the Noel administration. In this capacity he was often called on to act as Governor, and as presiding officer of the Mississippi Senate was a decided success. The deceased is survived by five children, as follows: Charles P. of Baton Rouge; Luther, police justice of Jackson; Douglas, James Lewis and Miss Elizabeth, all of this city. David Manship, ca. 1865. Accession number M2011.1.1 MDAH Museum Division collection. MANSHIP-MARTIN-at Loves Station, Miss., March 11th, by Rev. T. Page, Mr. D. Manship, of Jackson, to Miss Lu Martin, of Loves Station. 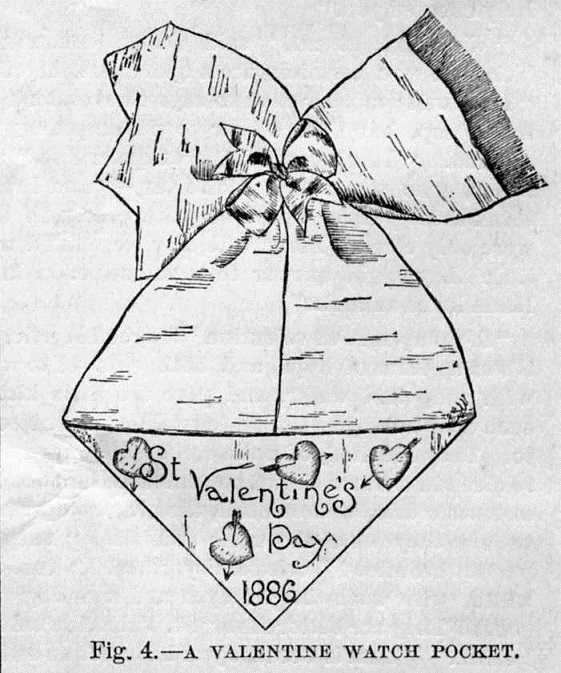 “Instead of sending useless trifles of cut paper, we think it far better to have the valentines in a measure useful, as well as tasteful, and were glad to receive from Mrs. E. S. Welch, who has given so many pleasing designs for the Household Department, some which may be readily made by the boys and girls, and sent to friends as valentines. . .
WATCH POCKET FOR A VALENTINE. The Manship House Museum offers programs and group tours by appointment only while restoration efforts continue at the closed site. Structural repair to the building’s foundation has been completed and a long-term project to correct damage resulting from extensive foundation movement is underway. Restoration of the circa 1920 Visitors Center’s exterior also continues. For more information call or to schedule a group tour, 601-961-4724 or info@manshiphouse.com.